Home » without » Boy With Missing Cerebellum & Pons Learning to Walk! Boy With Missing Cerebellum & Pons Learning to Walk! 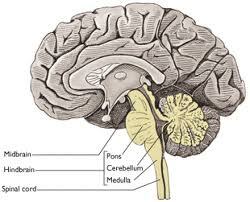 First off... the cerebellum and pons are part of the brain that is responsible for some very important things like balance, breathing, regulating blood pressure, heartbeat, etc. So one would think that without a cerebellum or pons, life would not be possible. Well... it seems that may not be quite true. You see, there's a young boy missing those parts of the brain who not only is living without mechanical assistance, but eventually managed to sit up on his own, something he shouldn't have been able to do without a cerebellum to provide balance. Next he learned to crawl, first dragging himself military-style, then pushing himself upright. Now, he's learning to walk.